If you'll remember, back in February, Michelle Mach made a call for participants in a Button Swap. I was quick to sign up for this challenge. You know I'm a button fiend! Before long, I was exchanging e-mails with my swap partner Maryanne of Zingala's Workshop and sorting out buttons to send to her. Maryanne left me gasping when I received the button goodies in the mail from her. It wasn't long before I set to work on some projects incorporating those treasures. I even gave a few sneak peeks here as teasers. At long last, I can tell you my process and show you what I created. Hold on tight! I placed the card Maryanne sent on my bulletin board for a few days to gather some inspiration. However, I knew as soon as I saw the buttons she sent that I would start with the handmade green button first. No matter how I looked at the button or turned it over in my hands, it screamed at me over and over, "I'm a Tree!!" So a tree I made her! Since I had just finished watching the whole The Lord of the Rings Trilogy again when I made her, I imagined that she is one of the lost Ent Wives. Of course, at other times I consider that she is a wood nymph. I know that this necklace is a bit unconventional, but I really HAD to make her into the tree she so desperately wanted to be. It was a simple matter of twisting green seed beads and wire to make her branches and then braiding silk ribbon, a suede strip, and hemp cord for her trunk/body. I added some brown seed beads for a little sparkle. More suede cord and a clasp were added to complete the necklace. Once that necklace was complete, I knew I wanted to make at least one more project with the buttons. 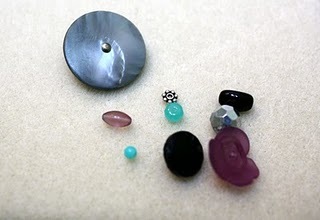 I opted for the grey pearl button and selected a few complementary beads and a small glass button. With some head pins, lengths of chain, and jump rings; I formed a simple focal that was added to a chain. These necklaces are at two opposite ends of the spectrum, but that's so much like me! Before you start hopping around to see what everyone else has created with their buttons, let me tell you that Michelle (our gracious host) is having a giveaway of a set of buttons. She has more details on her blog. But here's the gist. Comment on each of the Button Swap Blog Hop blog posts and you get one entry for each comment. That means you can get 25 entries into the giveaway. Leaving me three comments will NOT get you three entries, only one. So, leave me a comment and hop away!! 13. Linda D. - Lutka and Co. I especially like your gray pearl button necklace. Nice work! What lovely pieces, and both are unique. The button blog hop sounds like fun, and I've had a blast seeing all the lovely creations! Great job, looks like you had fun!! VERY cool! The Lost Ent Wives -- I LOVE Lord of the Rings -- I'd read The Hobbit a billion times as a child but didn't read the rest until I was an adult living in Italy, of all places. Fabulous. Those both turned out great. I think my favorite is the 2nd one, just because I like the buttons/beads and the metal. Great job with both. Hope that is amazing! Love, love , love the tree, so cool! Thank you all for the lovely comments. I was a little nervous about how the 'tree' would be received. I'm glad to hear that y'all like it too! And Lori. . I started with the Hobbit as a child as well. I'm so glad they're finally making the movie version so I can have a complete set!! Hope, I can't tell you how excited I am with what you did with the buttons!!! I LOVE the tree, the fact that you braided silk ribbon and hemp for a trunk is brillant! And, I love the other necklace. The gray button looks so good as a support for the other beads. I just love both necklaces. So cool!! Love your creative thinking...can I crawl inside your brain for a little while? Great necklaces. Congrats on making TWO great necklaces! Hope, your tree design is really clever - and I really like how you continued the earthy theme by using leather cord. Your second necklace is a great wear-with-everything piece - just gorgeous! I'm enjoying seeing all of the many ways everyone thinks to include buttons with their jewelry! What an imaginative piece - and perfect for Earth Day! It's fun to see everyone's different takes on using buttons. How fun to do a movie-inspired piece! I don't think I've ever tried that. (Books, yes; movies, no). I like the chain necklace--that looks like the kind of piece I'd wear. Thank you for joining the swap! How inspired and creative both pieces are. Love that you saw a tree and turned it into one. Ok, the gray button necklace is awesome, and I would be wearing it all the time, but I am just in love with the tree one! I'm also a Lord of the Rings fan, and as an avid child reader, I did the trilogy as a kid! Tried to get my kids hooked on them. They did enjoy them, but they are much more Harry Potter fans. What a great idea making that into a tree! Great job!! I would wear that gray pearl button necklace in a beat! The tree is great as well! I love Lord of the Rings! Great analogy! You made two very different and awesome creations with your buttons! What a wonderful imagination you have. That secret muse that speaks to you. Great designs, both of them. Love that little tree! 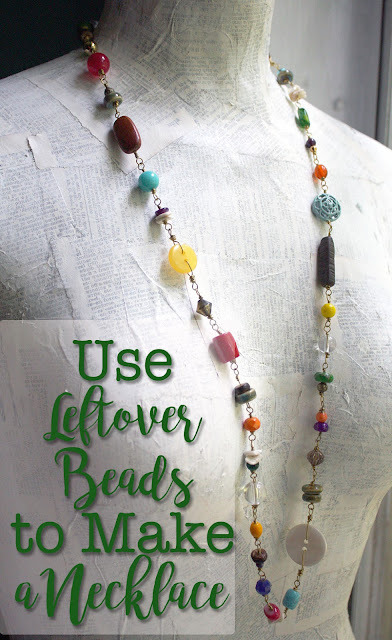 What a fun idea with the Tree Necklace. Great job. Yes, she became a tree! Great eye. Love the buttons and the imagination that figures out such neat ways to use and display them! Good work! I really love the tassling ideas you used! They look great! Hope - what beautiful necklaces! And I love how you went from one end of the spectrum to the other with them :) You did receive some very beautiful buttons...what a fun blog hop! I love what you created with your buttons. The tree is wonderful and also the other necklace. I really liked reading about your creative process also. I love your simple, elegant designs. Great work! I am a bit late to the party...thanks for keeping the doors open for me! I think that is very clever. (And for the record, my beads talk to me too!) I love the simplicity of that second one. You were super inspired! Thank you for sharing. Enjoy the day!